Additional Info: Bed linen is supplied free of charge. You need to bring towels. 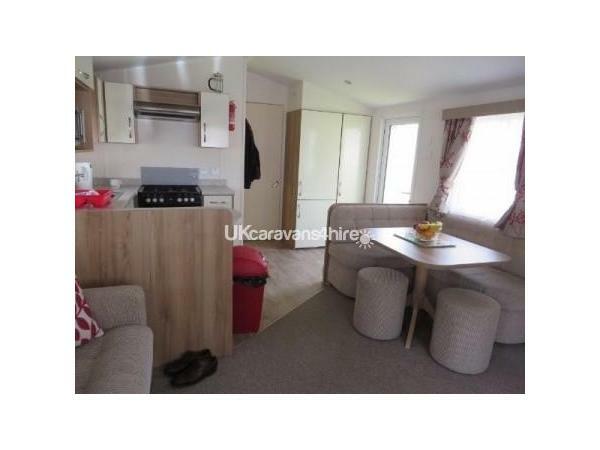 WiFi can be accessed in our caravan. Charges apply - £35 for 2 devices and £45 for 4. We have an outdoor store which has beach chairs, windbreaks, buckets, spades, boules, body boards, cricket etc which our guests are welcome to use. Provisional bookings will be held for 5 days and £100 deposit is required. If a deposit is not received, the dates will be made available for others to book.The balance of your holiday needs to be paid 6 weeks before your arrival. If you ask to cancel your holiday, once the balance has been received, we may consider a partial refund if you have a valid reason why you cannot attend and you can provide supporting evidence. It would be dependent on our being able to sell the week you have booked. It is your responsibility, as the hirer, to make sure you have holiday cancellation insurance in place. Check in 5pm - Check out 10am. WIFI has been installed in the caravan. The site charges are £35 for 2 devices and £45 for 4, per week. 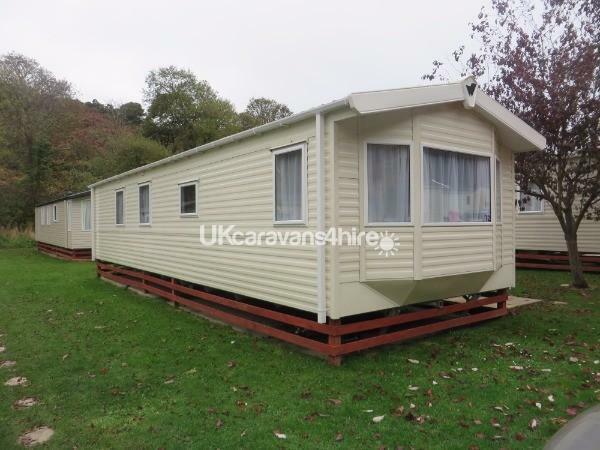 Having spent great family holidays at Cardigan Bay Holiday Park, we bought Number 72 in October 2015. 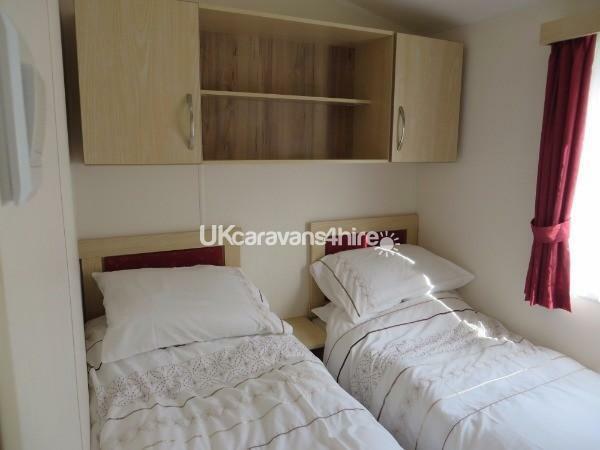 Our lovely caravan has a double bedroom with sink, toilet and generous wardrobe space; it also has two twin bedded rooms, well furnished with cupboards and storage. The shower room, with sink and second toilet is a good size. There is a gas fire and central heating. 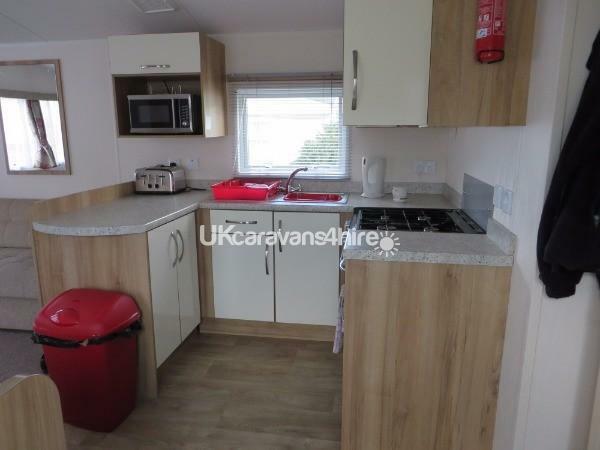 A fully equipped kitchen has plenty of cupboard space, a microwave, full size cooker, slow cooker, sandwich maker and large fridge freezer. TV and DVD player are installed if you have time to watch! Our family includes toddlers, teenagers and adults including those lucky enough to be retired. 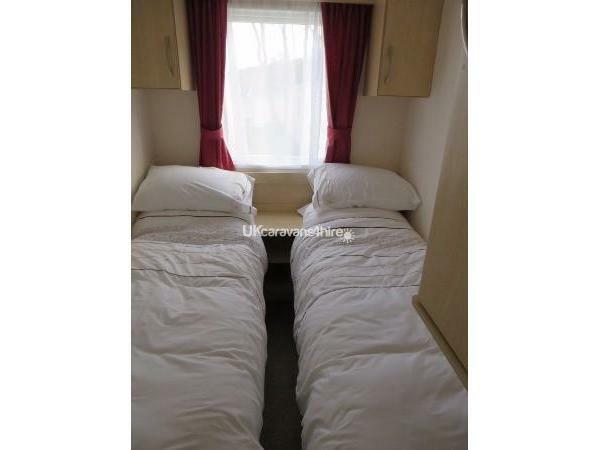 We have anticipated all your needs when fitting out our caravan. We have a range of board games - young to adult - to add to your relaxation after fun packed days. Outside facilities include a patio with picnic table; a store with beach chairs, windbreaks, body boards, buckets and spades etc which you are welcome to use during your stay. 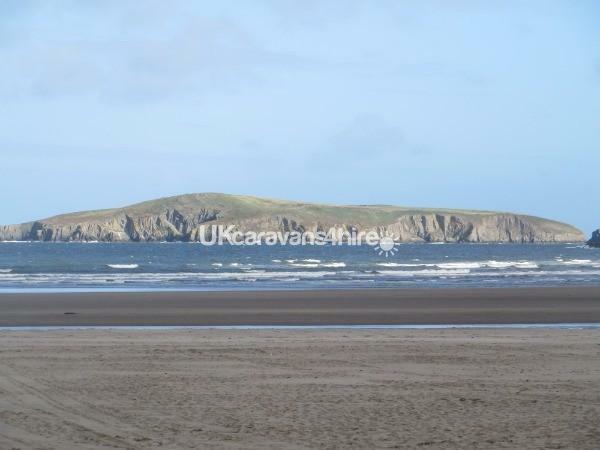 Our caravan is just 300 yards from award winning Poppit Sands and a fantastic place for your seaside holiday with many local attractions within easy reach. Initially, you may want to make the most of park facilities that offer you a safe and comfortable place to relax and have fun. 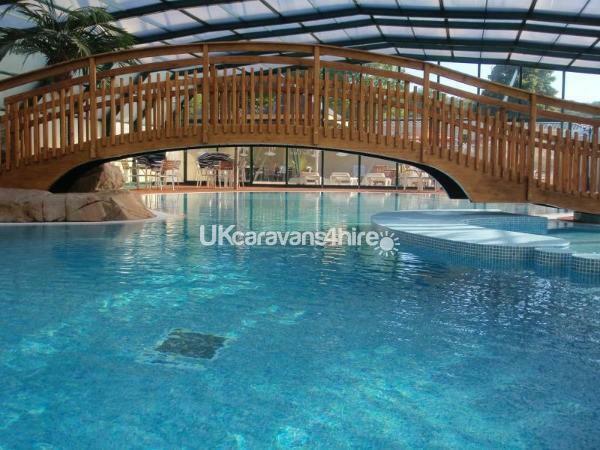 They include a brilliantly designed pool complex with its waterfall, hot tubs and retractable roof which provides a really tropical experience. The Lounge Bar provides your evening entertainment. (see timetable below) A children's adventure playground also offers lots of fun. 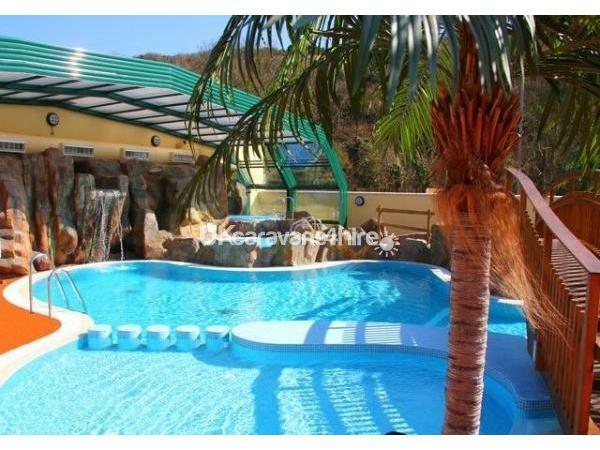 This is a very popular site which is quickly booked up and once you have visited you will understand why holiday makers return year after year. Poppit Sands, with its sand dunes, extensive sandy beach and rock pools offers plenty of space for beach games, fun in the sea, picnics and just taking in the fantastic views. (see the website video) It is so extensive, it never looks busy. The beach can be accessed by a footpath or by road. If you like a good walk, we recommend you take the Coastal Path or a beach walk to the Webley Hotel in time to sit in the garden to watch the salt marshes rise or fall with the tide, the abundance of birds and boats sailing up and down the estuary whilst taking a well earned drink! 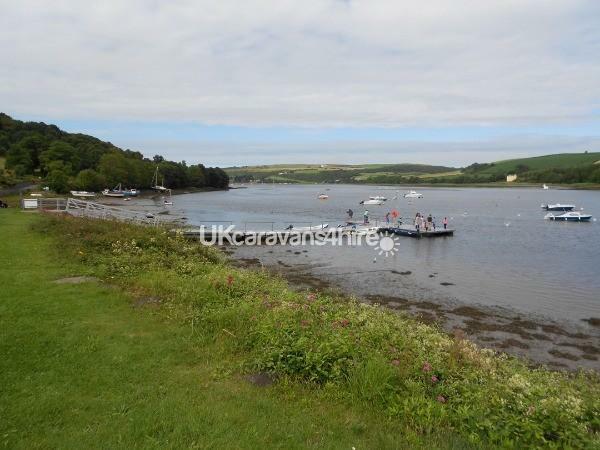 There are 15 coastal walks, all linked by the local bus which leaves from the car park.Crabbing on the jetty, further up the road, is another popular activity for young and old which members of our family have enjoyed for years. We could go on but it's much better to discover Poppit and Cardigan Bay for yourselves. Extensive sandy beach with rock pools to explore with a beach cafe for meals, snacks, ice creams and beach toys. 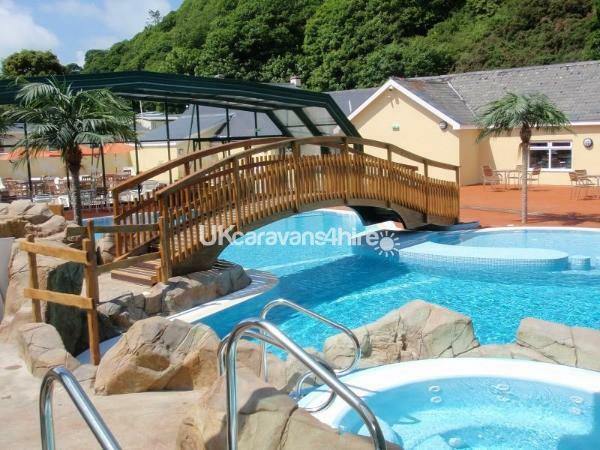 There are beautiful walks; waters sports; nature reserves; pubs, clubs and restaurants; theme parks for all ages within various distances from Cardigan Bay Holiday Park; takeaways; fishing; historical attractions. The RNLI lifeboat crew practises on Poppit beach most Sundays and the RNLI shop stocks lots of toys and holiday gifts. There's a lot to do in Cardigan Bay and the campsite office has a full range of leaflets about available entertainment. Cardigan town has market days and the High Street contains a range of shops for your needs. There are several supermarkets and they deliver to the site. A welcome folder, packed with information, is also available in Number 72, to help you settle in. There is also a full inventory of equipment that is sent to customers to help them cut down on packing and increase car space. Additional Info: Site Facilities Not Requiring Membership / please note opening times. Indoor Pool Complex -Leading from this Bar is the heated terrace with contemporary parasol that over-looks the children's play area. Dolphin Lounge Bar - Leading from this Bar is the heated terrace with contemporary parasol that over-looks the children's play area. Mar 30 - Nov 2 The bar offers live family entertainment or resident DJ 5-7 nights per week during peak season. Bar snacks are also available. (Thu-Mon evenings only), Smugglers' Cove Restaurant which is open Friday to Monday evenings and Sunday lunch, most weeks of the year. It is recommended that you book, especially for Sunday lunch. A bar snack menu has recently been introduced. The Dolphin Bar offers live family entertainment acts or resident DJ 5 - 7 nights a week during peak season. 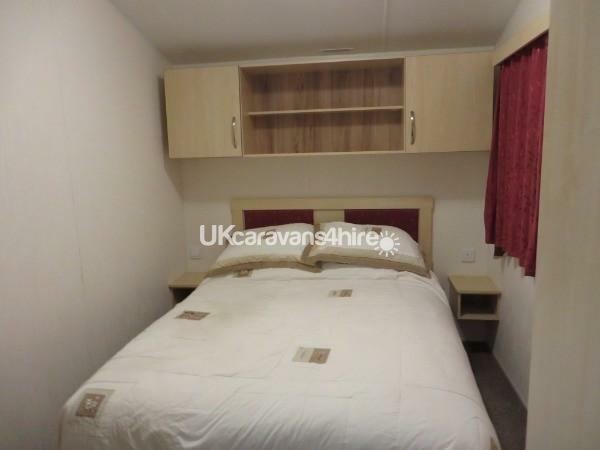 There is a small shop, amusement arcade, launderette*, WiFi is accessible in reception and bar areas; there is a delivery service for newspapers and groceries. *charges apply for launderette. 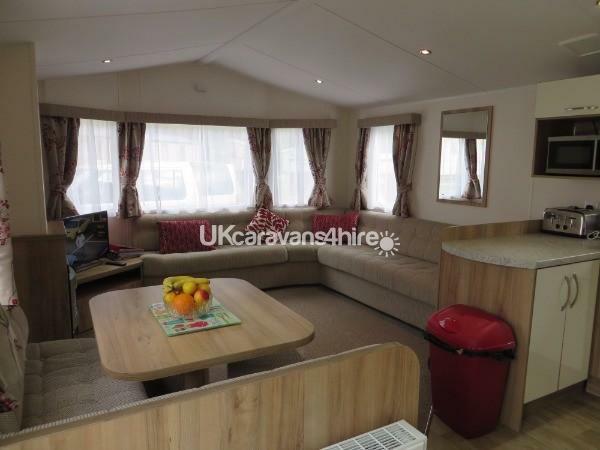 Please note, Wi-Fi is also available in the caravan and free of charge to our guests.